It all started in 627, when a wooden structure was built—hurriedly, according to the history books— to baptise Edwin, King of Northumbria. Hurriedly? Personally, I find this hard to believe. Was there no other place to baptize this child? Really? Not one church in the area? At any rate, the church soon fell into disrepair. Someone then came up with the idea of rebuilding it in stone, which they did. Unfortunately, the new structure was destroyed by fire in 741. You’d think they’d have given up, but no, they rebuilt again. The Minster was damaged in 1069, then repaired; destroyed in 1075 by the Danes; rebuilt; another fire in 1137; more repair. Then in 1220, the town began building a Gothic structure to compare to Canterbury, of which many tales have been written. This new York Minster was completed in 1472. Years went by. The Reformation brought looting of much of the cathedral's treasures; Elizabeth I wanted all traces of Catholicism removed from the country, leading to the destruction of York Minster’s tombs, windows, and altars; then the English Civil War; and Cromwell in 1644. And still the people persevered. In 1967 a survey revealed that the building was close to collapse. Money was raised and to reinforce and strengthen the building foundations. Then a fire in 1984 destroyed the roof, and more money was raised for repairs. When we visited in the 1990s, the Minister. was enshrined in scaffolding; the rebuild goes on. Click "satellite" and zoom in to see York Minister today. It's huge. Clifford's Tower gets its name from a grisly incident that happened long, long ago when Roger de Clifford, who was found guilty of treason against Edward II, was executed. To make sure that the village people (the people who lived in the actual village, not the music group) got the message that acts against the king would not be tolerated, Clifford's body was hanged by chains from the tower walls. I'm not sure who decided to name the tower after Clifford. I'm not sure whether his family felt honored by the naming. To strengthen his military hold on the north, William the Conqueror built two motte and bailey castles in 1068-89. 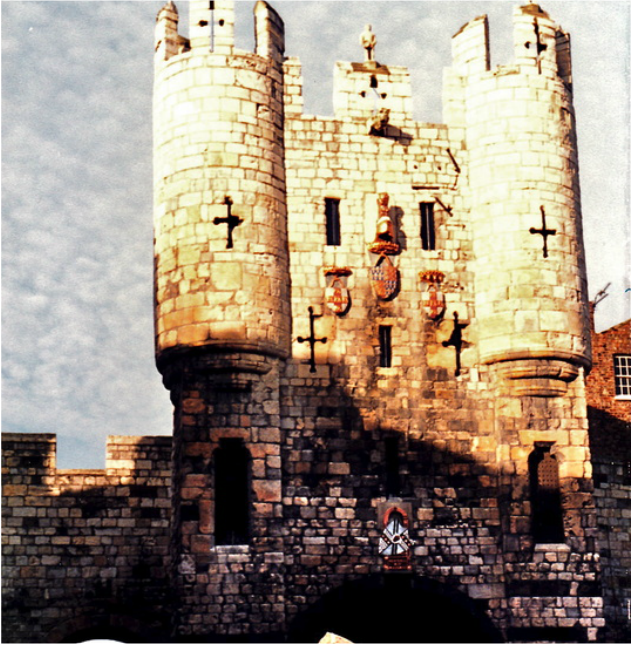 Both were burnt to the ground by a Danish fleet, who were helped by the people of York. Pissed but undaunted, William rebuilt both. Later, they were burned down again. Clifford's Tower is pretty much all that remains of the stone castle that was later built on the same spot. William picked a really good location, as the tower offers panoramic views of York and the surrounding countryside. Probably it was built not so much for the views as to scout out enemies far enough in advance to have time heat up the tar and pluck the feathers. ​Over the years the tower has served as a prison and a royal mint, and Henry VIII used it as a place to display the bodies of his enemies. I am assuming the bodies were dead. ​Here's what's left of the tower today. It's a pretty steep hike up that hill. Trust me. This is how York used to look. Today you can walk around that wall, and climb the ​hill to that lookout tower. Reconstruction drawing of tower and walls c. 1200: Terry Ball (English Heritage Graphics Team). Here's how the inside probably looked. Fun Fact: The stairs that go up castles towers are spiral. Most often, they turn counter-clockwise. This is for a very good reason, of course. They spiral to the left because It's very difficult for attackers to go up the stairs with their swords in their right hands. Hah! Foiled! Mid 14th century reconstruction drawing by Peter DUNN (English Heritage Graphics Team). Weaving in out and between the buildings in the city of York are teeny tiny streets and footpaths. Most have been around since medieval times and some are so narrow you can literally stretch your arms out and touch both sides at once. A local author named Mark W. Jones coined the word snickelway in his 1983 book A Walk Around the Snickelways of York. The word is a portmanteau— such a lovely word—of the words snicket, meaning a passageway between walls or fences, ginnel, a narrow passageway between or through buildings, and alleyway, a narrow street or lane. Clever, huh? Jones just up and invented a word and now everyone is using it. I am so jealous. 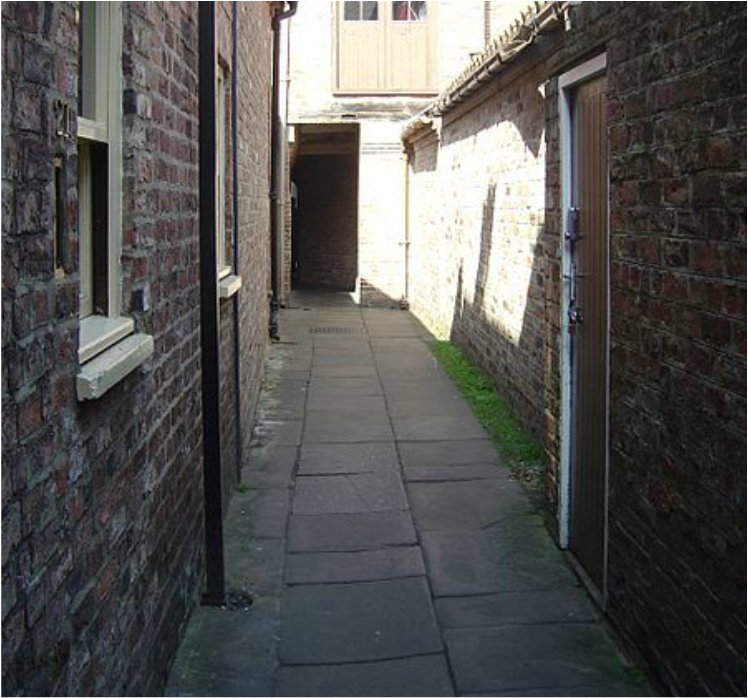 "A Snickelway is a narrow place to walk along, leading from somewhere to somewhere else, usually in a town or city, especially in the city of York." Don't you just love the "leading from somewhere to somewhere else"? At nearly 220 feet, Coffee Yard is the longest Snickelway. Hole-in-the-Wall. This is the shortest Snickelway. 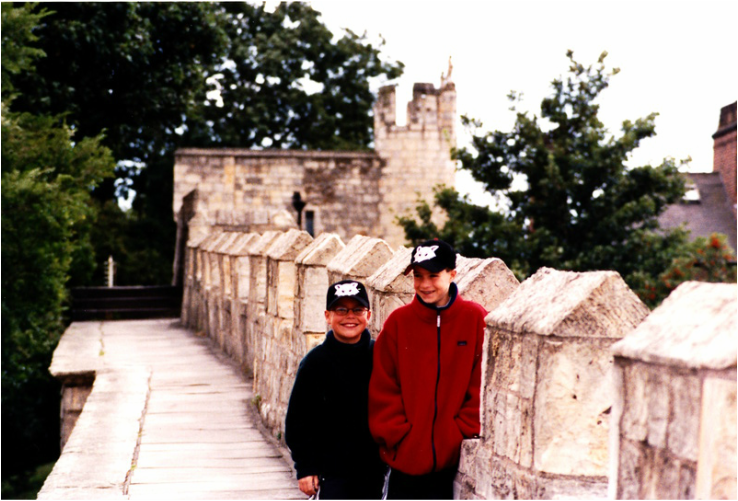 York has been defended by walls since Roman times. Most of the walls today, which encircle much of the city, were built in the 12th -14th centuries. So when you walk these walls, you're walking on history—on the same walls knights and kings and medieval common people walked on. If you want to walk old historic walls, there's no better place: York has more miles of intact wall than any other city in England. Sometimes both events occurred at the same time. Richard's head was actually displayed there in 1461— until his son, King Edward IV, replaced his father's head with those of the Lancastrian leaders captured at the battle of Towton. And so it goes. 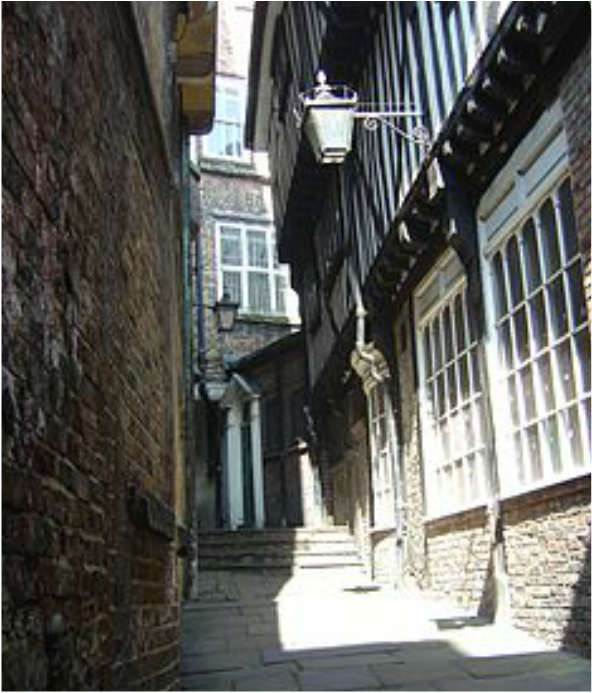 The Shambles is a narrow, cobbled lane lined with 15th-century Tudor buildings that overhang the street. It is the most visited street in all of Europe. 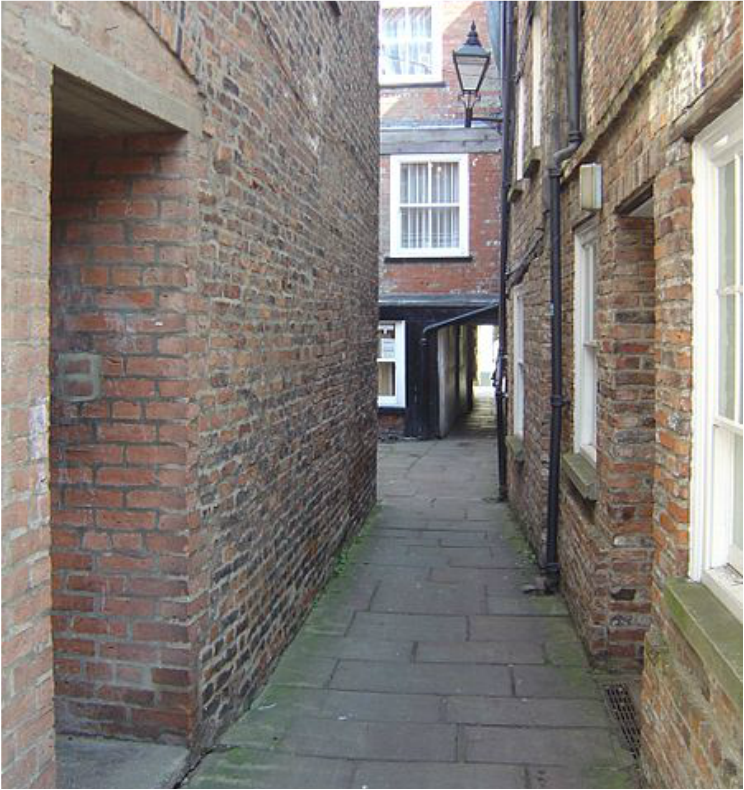 In 2010 The Shambles won the award for Britain's Most Picturesque Street, based on votes collected by The Google Street Team. That's pretty amazing, really. The word “shambles” comes from the Saxon word shamel, which means “slaughterhouse,” probably because in 1862 there were 26 butcher shops on this street. If you look closely, you can see that the pavements on either side of the street are raised up. This was done so the butchers could dump their butcher waste into the channel and all the blood and guts would slush down the street. Cool, huh? Nice smell, probably.